The leaves are changing color, there is a distinct, crisp breeze in the air and Hocus Pocus once again returns as the movie of choice for children of all ages. This can only mean one thing—fall has arrived. While many autumnal traditions return to the fore and fill our social calendars (I’m looking at you, apple picking), 2013 has given us something new to obsess over—Thanksgivukkah. This year, the first night of Hanukkah begins on Thanksgiving, allowing Jews from all over America to combine two much beloved holidays. These two seasonal favorites haven’t overlapped in over 100 years and people are looking to make the most of this rare occurance. Those of us in the millennial generation were introduced to this concept of an über holiday by The OC’s ultimate NJB (nice Jewish boy, for those not familiar with the lingo), Seth Cohen. Chrismukkah exemplified a phenomenon not new to American society, being a part of two separate cultures simultaneously. While there is no beloved Seth Cohen to introduce this new holiday (side note—am I the only one who is seriously lacking some Adam Brody in my life these days? ), there seems to be more buzz than ever about this new two-for-one holiday. With Buzzfeed articles about decorations and recipes and a Stephen Colbert segment on the audacity of Hanukkah to step on the toes of the all-American festivity, it appears as if the hybrid holiday is taking America by storm. But what exactly does this mean for us as American Jews? I feel that Thanksgivukkah allows us to perfectly blend our two cultures, giving us a chance to truly be simultaneously Jewish and American. In a way this holiday helps us define who we are. It is a physical representation of our dual identity and allows us to take pride in that. It also provides us the opportunity to have fun and be creative with our Judaism, giving it relevance and a place in our lives as hyphenated Jewish-Americans today. In a world where Jewish and non-Jewish holidays are seen as being in competition with one another, Thanksgivukkah removes this tension from the equation. Instead of being the marginalized step-sister of the holiday season, Hanukkah is being fully integrated into the most American of holidays. 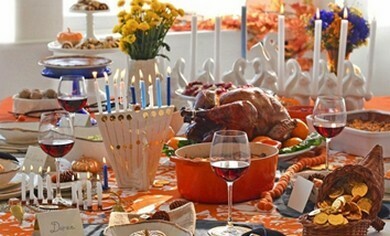 Thanksgivukkah is the ultimate statement of Jewish-American pride, proclaiming the uniqueness and achievement of the hybrid community. So this year, revel in playing spin the dreidel for slices of pumpkin pie instead of gelt, wash down that turkey and stuffing with some Manischewitz and enjoy a double feature of Charlie Brown Thanksgiving and Fiddler on the Roof. After all, this mega celebration won’t happen again for another 79,000 years—l’chaim!